We get a lot of phone calls asking about CNC software. People want to know what to use for design, CAM and more. 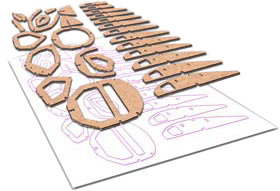 We find that in many of these instances, the person is a beginner to the world of CNC and looking for information to ensure that they are not getting in over their head when they aquire a CNC machine. There are so many choices on the market for CAD and CAM packages and many are very expensive and have a steep learning curve. It is hard to justify a $1000 piece of software just to use a $2000 CNC system. Stepcraft machines are designed to be easy for anyone to use and we want to be sure we recommend software that is equally easy to use, which is why we recomment Vectric Cut 2D for just about every customer. The features and ease of use with this program is second to none. 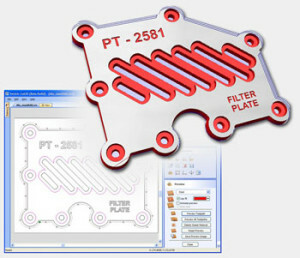 At a price of only $149, Cut 2D is not only a very powerful CAM (toolpath creation program) but also a powerful drawing program. This eliminates the need for beginners to have to learn two separate programs. There are a lot of tutorial videos online and on Vectric’s website to show you how to use all the funcationaly of the program, which makes learning a breeze.